Tinted windows and bluetooth. 6-Speed Automatic HD Electronic with Overdrive, Onyx Black, Light Tan w/Perforated Leather-Appointed Seat Trim, AM/FM Stereo w/MP3 Compatible CD/Navigation, Front Center Armrest, Front fog lights, Heated front seats, Heated rear seats, Navigation System, Power Tilt-Sliding Sunroof w/Express-Open/Close, Rear-Seat DVD Entertainment System, Roof rack, Spoiler, Steering wheel mounted audio controls, Turn signal indicator mirrors, Ventilated front seats, XM NavTraffic, and XM Radio. 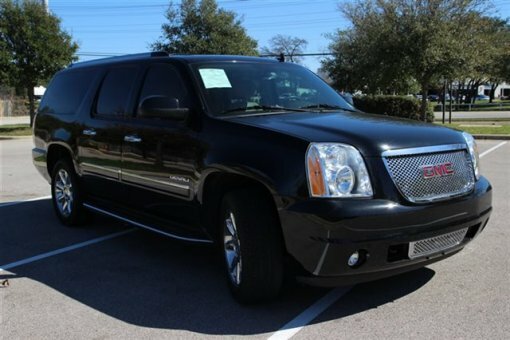 Imagine yourself behind the wheel of this outstanding 2011 GMC Yukon XL. Take some of the worry out of buying an used vehicle with this one-owner creampuff. Designated by Consumer Guide as a Large SUV Best Buy in 2011.